Hurray! I so look forward to this challenge every year because going to Narnia is not only entertaining, but I find it energizing. C.S. Lewis was a master storyteller and the way he wove scriptural truths into this series bolsters my own faith. Once upon a time I read the Chronicles of Narnia in a week. So if you look on my sidebar here you'll see a label for "Chronicles of Narnia Reading Challenge" and a "Narnia Week." My more thoughtful posts are definitely under "Narnia Week" but I am hoping to dig a little deeper during this particular month, focusing my entire time and attention on Voyage of the Dawn Treader. 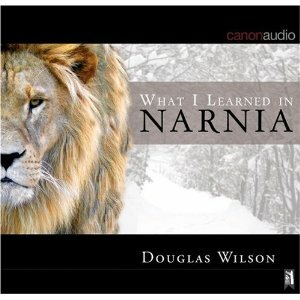 You should know that I approach The Chronicles of Narnia believing them to be written, as Doug Wilson calls it in his audio lecture series, What I Learned in Narnia , a "great supposal." Suppose Christ were to have entered into another world and suppose He had another name? I don't believe that C.S. Lewis wrote these books to be an allegory, but I do believe he wrote them to introduce children to the concepts of Christianity. I explained why I think that when I was reading Narnia back in 2008. In the meantime, I invite you to come along this journey for pleasure and entertainment! Bring your kids! I found a few light chapter book adaptations that I'll be reading through with Bookworm1. I'll be sharing more about those as we go along. For a synopsis of the Chronicles of Narnia books you can click on that link and it will take you to a brief description of each of the books in the series. I've decided to split things up. To help get you into the challenge I have TWO gently used copies of The Magician's Nephew to give away to two of you. This is the first book in the series, chronologically speaking. 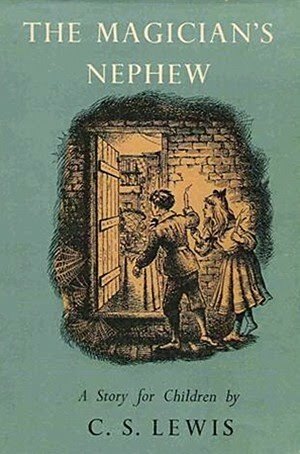 Lewis wrote The Lion, the Witch and the Wardrobe first, but if you want to understand Narnia history better, it's best to start with The Magician's Nephew . Then! At the conclusion of the challenge, I have some Narnia gift books, guide books and fun Narnia things to giveaway which I'll tell you about later. The only thing I'll say on that for now is: The more you read, the more chances you have to win! This challenge will run for the whole month of July. Of course, I would love it if you let us know that you plan on participating in the challenge. On Friday, July 30th I will conclude the challenge with a post wherein you can link up all of your Narnia related posts from this month. I'll draw a winner from THAT post to determine who will win the "Narnia Prize Package." The main point of this challenge: HAVE FUN! we are so in the girls have their books I have mine and it's going to be a great fun family read aloud month!! we don't own this book so it would be so great to win! I'm in, embarrassed to say that I have never read these books. Don't know how they got passed me, maybe they weren't encouraged in school. I'm going to try to get my boys to join in too. I always can use another CS Lewis book! What a great give away ~ count me in! Thanks for hosting this. I need to give this some thought. I'm thinking I might read 'Inside Narnia' this month. We're leaving for the weekend today, but I'll try and get a post up when we get back. I absolutely LOVE them :) Can't wait for the new movie in Decemember either. You'd think I'd be sick of them, but I'm not in the slightest. I actually just started rereading the series last month, so I am in for two books. Here's my post about what I hope to accomoplish this month. Count me and my kids in too! We might be listening more than reading, but I hope to get through the whole series. I've never blogged about them, so I'll try to keep up with that too. I'd love to win The Magician's Nephew! I am in! My favorite way for new people to be introduced to Narnia, though, is through the Lion, the Witch and the Wardrobe & experience how those characters first found it and then go back and read the history of it later after falling in love with Narnia & asking some why questions later. I will post an intro to the challenge on my blog later. I have had out of town company for a week. And also someone else can also win the books, I have a couple of copies already. Thanks so much! I'm in for listening rather than reading. And I might try to find the other movies to watch this month. I LOVE this series. And I had NO IDEA Voyage of the Dawn Treader was coming out this year!!!! I would love to win this for my nephew. He would love it. Thanks for the chance. Please enter me in this giveaway! I would love to read this book. I would love to win this book to give to my son because he loves the Narnia movies. Forgot to come and sign up on the first, but I'm definatly going to have a go at this. We only own the anthology-like book, so I think it'd be fun to collect the individuals, too! Tomorrow I'm posting about my plans to be part of the challenge and inviting others to do the same!